A warrior sets out on a blood-soaked path of destruction that brings him face-to-face with the Norse god Odin in this unforgettable animation from Joseph Bennett. Originality is something we’re always searching for in our Short of the Week picks and they dont come much more original than Joseph Bennett’s epic adventure ODIN’S AFTERBIRTH. 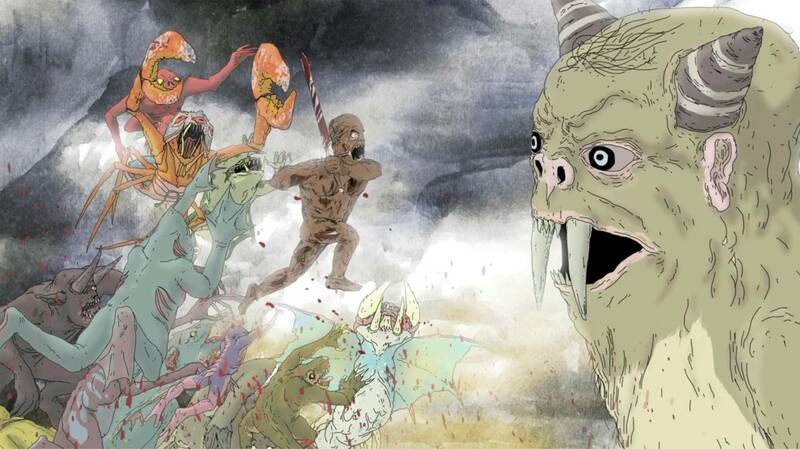 A grotesque fantasy that sees its protagonist ‘Viking Erik’ embark on a relentless quest for vengeance, this 14-minute animated short follows its hero as he battles his way through an army of freaks and monsters and defies the gods that rule his world. Inspired to create his story after viewing the trailer (not even the full film!) for Valhalla Rising, Bennett admits the teaser for Nicolas Winding Refn’s violent feature motivated him “to make something absurd and brutishly sentimental”. Created over a four-year span and originally served up as three individual chapters (with a three year gap between the 2nd and 3rd chapters), here at SotW HQ, we’ve had our eye on Bennett’s trilogy for some time and its great to see the trio of shorts sewn together into one longer cohesive piece. “Chapter 1 was made when I was still very new at animation so I was figuring a lot out, says Bennett, “in fact it’s kind of embarrassing to watch now. Throughout the series I was fortunate enough to work with some incredibly talented animators and illustrators that were very influential”. Although Bennett admits he “loved working on Odin” it seems as if this is the last we’ll see of his rampaging warrior, with the filmmaker now looking back at his project as “a product of its time and place”. Fear not though, if you loved ODIN’S AFTERBIRTH as much as we did, be sure to check out Bennets’ Vimeo account for more of his work, his prolific output should keep you entertained for a while.